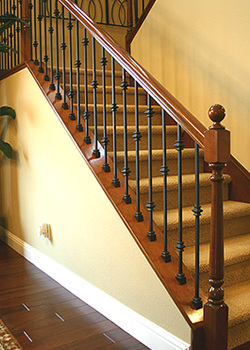 For over 35 years Folsom Stair & Woodworks has been helping homeowners with staircase design and ideas to make their existing stair and balustrade be safe, functional, and beautiful. What Impression Does Your Staircase Make? Your staircase is the largest piece of furniture in your home and many times overlooked in the remodeling process. In many homes the first impression as you enter the home is of the staircase. Is it exciting or is it boring? Does your staircase have that Wow factor? Is it tight and clean with no squeaky treads? A free full review of your existing Staircase by Folsom Stair will help you answer the many questions you may have about getting your staircase updated. Here are three basic areas to review. Update Your Staircase with beautiful hardwood treads and risers! Update Your Staircase with decorative iron balusters! Update Your Staircase with a complete staircase replacement!